The façade of UF’s Innovation Hub. SharpSpring founder Rick Carlson sat down to discuss his state-of-the-art business. For years, Gainesville was often perceived as the launching point for people shaped by the University of Florida, but now more entrepreneurial-minded alumni are returning to launch their global businesses from the college town turned tech-savvy center. For many of these companies, their close ties to UF play a significant role in their success. Others chose Gainesville due to its large talent pool, low cost of living, tax incentives, high quality of life, and the abundance of affordable, customizable office space. Nanotherapeutics, SharpSpring and Feathr are three of the latest companies headed by UF alumni to establish headquarters in the Gainesville area. The rising success of these companies has signaled Gainesville’s transformation into a thriving hub ideal for business growth. Nanotherapeutics, a biopharmaceutical company that specializes in development and manufacturing, is one such example of a successful company rooted in years of collaboration with UF. Founded in 1999 by James Talton, who received his Ph. D. in Pharmaceutical Science at UF, Nanotherapeutics has thrived since starting out at the Sid Martin Biotech Development Institute. Talton’s decision to stay in Gainesville was motivated by the quality and affordability of lab spaces available to UF licensed companies. The continued support from the biotech incubator and Talton’s focus on National Institution of Health grant acquisition led the company to rapid growth. In 2011, Nanotherapeutics collaborated with UF to become the prime offeror on the Biomedical Advanced Research and Development Authority flu vaccine contract. At the time, Nanotherapeutics was too small to handle the $1 billion contract, so UF assembled a team to partner on the proposal. Nanotherapeutics was a finalist in the running for the contract to develop large scale vaccines for influenza, and the support from UF was integral to this success. Although they did not receive the contract, it prepared Nanotherapeutics to submit a similar proposal in 2013 for which they received a Department of Defense contract to manufacture medical countermeasures. This $450 million contract provided the funding to open their 183,000 square-foot plant near Progress Park in Alachua. For Nanotherapeutics, the proximity to UF is a catalyst to their success, especially given the talent graduating from UF, noted Gaines. Biomedical and pharmaceutical companies are not the only ones thriving in Gainesville. The Innovation Square corridor, a newly developed area located between the UF campus and downtown Gainesville, is pulsing with life as new tech startups move in and capitalize on the resources of the research institution in their backyard. Aidan Augustin and Aleksander Levental are among the mix of UF alumni who created a name for themselves in Innovation Square. Feathr, their digital event marketing software company, started at UF’s Innovation Hub, an incubator for startups and small businesses to collaborate and grow through mentorship and training. When they graduated from the Hub, they relocated to Austin, Texas, to grow and ultimately reinvent their business. After a year in the city renowned for startup culture, they pursued a more permanent location where they could start hiring their team. When deciding where to relocate Feathr, Augustin and Levental considered several cities that could provide a platform for their business to continue evolving and expanding. In the running for Feather’s new home were metropolitan areas like New York, Orlando and Miami. But during their search, Gainesville was a top contender. "The density of tech company peers and eminent walkability make Gainesville's Innovation Square/downtown area perfect for startups. Everyone is an important part of the community, whether you just launched or have 300 employees. There are a lot of opportunities for visibility and involvement,” Augustin said. Aside from the city’s startup culture, Levental and Augustin said that the talent pool in Gainesville is full of qualified potential hires eager for jobs at fast-growing companies. They found that recruiting in Gainesville was easier than in larger locales. The ability to network with faculty and students was another invaluable asset that contributed to their decision. Another Gainesville-based corporation was founded by Rick Carlson, UF MBA and CEO of SharpSpring. 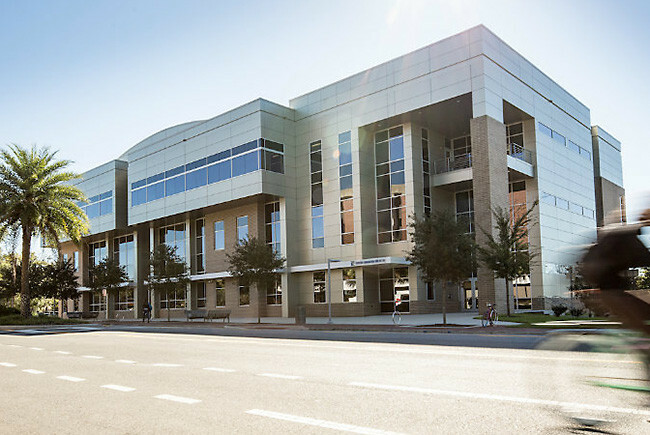 Located in Innovation Square, the global headquarters of this publicly traded digital marketing automation company is attracting UF students and producing exponential growth. “The downtown area, including Innovation Square, is attracting high quality companies, and there is a lot of momentum here for it to continue. 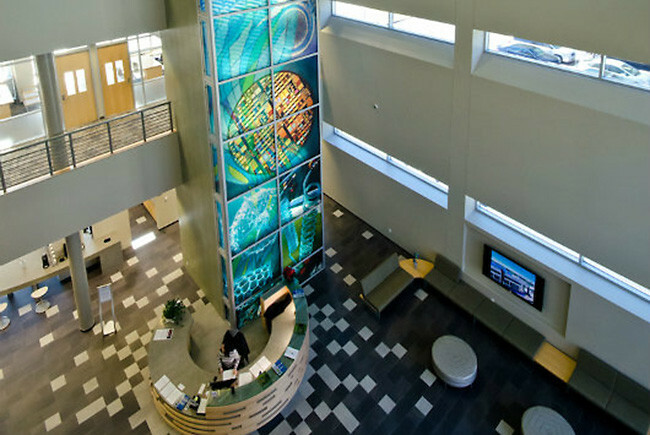 That, combined with the talent coming out of UF, is fueling the emergence of a true tech center,” Carlson said. In September 2016, SharpSpring made a move to the newly constructed Nimbus office building, the final chapter in a year-long collaboration between the company and local developer, Trimark Properties. John Fleming, managing partner at Trimark Properties, is a UF alumnus with deep ties to the Gainesville community. The goal was to customize a state-of-the-art 15,000 sq. ft. building to embody the culture of SharpSpring while paying tribute to the company’s roots in the Gainesville community, Fleming said. 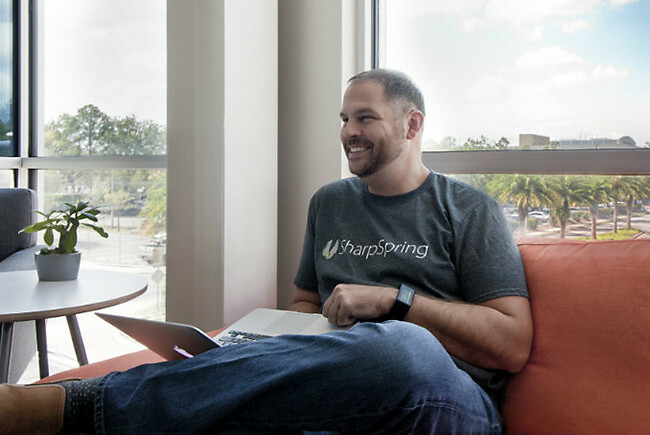 “The trending emphasis on office culture and work-life balance will position SharpSpring to attract the new millennial workforce,” Fleming said. The mounting success of local startups has driven the need for further expansion of Innovation Hub. With the completion of the second phase of construction at the end of 2017, more entrepreneurs will have the opportunity to establish competitive businesses by joining the Innovation Square family. This story first appeared at UF News, here.